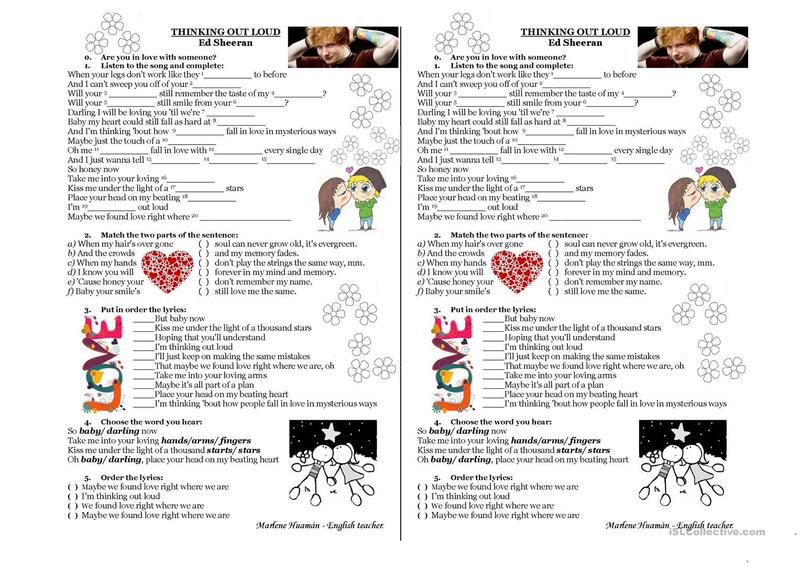 This is a worksheet where students listen and complete the lyrics. Also they match sentences and circle the correct answer. This worksheet could be used as an icebreaker at the beginning of a lesson because it's a famous song that students, especially teenagers love. This downloadable handout is best suited for business/professional students, high school students, elementary school students and adults at Beginner (pre-A1), Elementary (A1), Pre-intermediate (A2) and Intermediate (B1) level. It is aimed at consolidating Personal pronouns in English, and is useful for improving your learners' Listening, Spelling, Speaking, Reading and Writing skills. It centers around the theme of Valentine's Day. Marlene is from/lives in Peru and has been a member of iSLCollective since 2011-03-25 15:58:19. Marlene last logged in on 2019-04-22 04:38:36, and has shared 21 resources on iSLCollective so far.